Staffie Rescue was set up because we grew to love Staffies and we found ourselves helping so many. We decided to be bold and set up a website just for our Staffies. We were amazed that the domain name was on offer and only later did it dawn on us others weren’t actually queuing to help Staffies! So you will find us rather informal yet highly principled. We stand by our dogs and will try our level best. We are always carrying far too many dogs than we should but each photo represents a life that was saved and a family dog that will one day be that much loved ‘pooch’. Staffie Rescue is alive and vibrant. 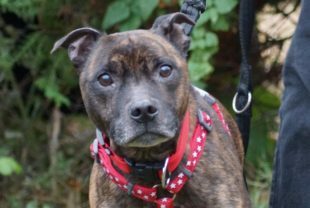 Our website is updated everyday so if you see a Staffie’s picture, unless something substantial has happened in the last 24 hours, they will probably still be available. Our Rescue is a registered charity and a registered company under Rescue Remedies Dog Rescue which is the umbrella service to all our dogs. 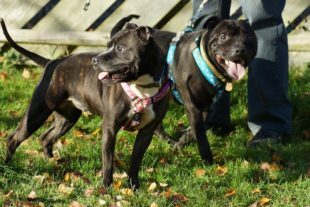 We not only run our specialist service helping Staffies but we also help working type terriers who often find themselves in the wrong hands and need our help. We are a determined few with many more who spur us on and support us financially; out at events; putting our posters in their cars or by admiringly watching our dogs progress through our Rescue via our Forum and cheer them on their way. Many came to us and homed their dog through us. We have a principle of that everyone offers, as volunteers, their experience and time for our dogs with an open heart. We don’t pay expenses; no one is on commission; our bank accounts serve to collect contributions in and are usually emptied to pay vital kennel or vet bills each week. A wing and a prayer sums us up. We don’t own kennels and we have use of three kennels currently to board our dogs in. We have about seven vets who reduce their costs in support of our work. Our religion is neutering and we are embarrassed by other Rescues who do not see this as the number one feature that protects that dog in making them a pet. We often take risks in agreeing to a dog without knowing the how’s and somehow the luck and the magic prevails. Our core membership is reflected on our Forum, though some members are more active on our Forum than others. Some volunteers play vital and focused roles like walking four of our dogs twice weekly at the kennels or co-ordinating an event like a stall at a fair. Others do regular and reliable admin. tasks or design our websites or printed cards or embroidered tee shirts. 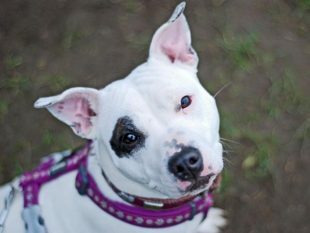 Most of the people involved have homed a Staffie or Terrier through us. Some have homed both or many. In our organisation you can see your efforts do count, we love incognito people and we won’t allow companies or businesses to hijack our Rescue for their own publicity. We are internet based and anyone serious in adopting or fostering a dog needs to first complete our homing questionnaire which is submitted electronically and allows us to focus you towards a suitable dog. We save our dogs from council pounds mostly and assess them quite accurately but may not know what their favourite colour is. We very rarely need to offer a dog peace but when we do we do it with great love and as our only remaining option. In assessment of our dogs we do not use behavioural speak. We talk more about their skills; confidence levels and preferences rather than dominance; issues or problems. None of us are perfect we all have our own character, we like to view our Rescue as a Tapestry of Talents.